Israel-based drone maker Airobotics Ltd. raised another $10 million for their recently announced Round C funding, CEO Ran Krauss told Calcalist Monday. This investment, led by Jerusalem-based crowdfunding firm OurCrowd, comes at the heels of a $32.5 million Round C funding announced in September. So far, the company raised over $71 million. The Round C funding was led by investment consultants BlueRun Ventures China Co. Ltd., with participation from Microsoft Ventures and from existing investors including Waze CEO Noam Bardin and Richard Wooldridge, former COO of Google ATAP. Founded in 2014, Airobotics develops and manufactures fully automated industrial drones used for surveying and security purposes in industrial facilities, mining sites, and refineries. 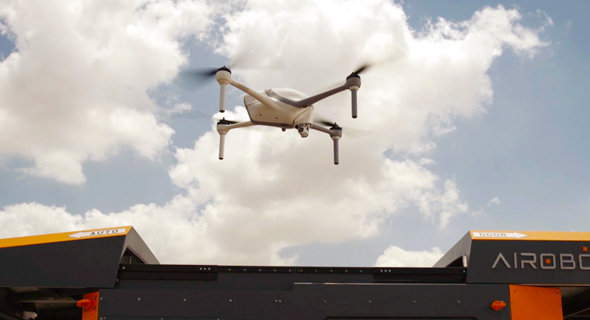 The company’s drones take-off from a large sized box and return to the box to recharge. Airobotics is headquartered in the greater Tel Aviv Metropolitan area, with additional facilities in Australia, the U.S., and Chile, and employs a team of about 200, mostly in Israel. The company lists Intel and Israel-based Israel Chemicals Ltd. as customers. Mr. Krauss said that the company has recently signed deals with two of the world’s largest mining companies, and that Airobotics is planning to expand its workforce by dozens of new employees. Mr. Krauss is set to speak on Monday at an event hosted by Startup Grind Tel Aviv. Startup Grind is a community of entrepreneurs operating in 300 cities worldwide with over a million members.